For a number of years, some of our sisters have been working with IRATE and First Friends drawing attention to the plight of immigrant detainees in the Elizabeth Detention Center. They added a Franciscan presence to the vigils and rallies held at the Center. The co-founders of IRATE & First Friends were invited to speak to all our sisters and associates. They raised interest in their organization whose goals are to do advocacy for the detainees, as well as to provide visitors and non-legal assistance to immigrants held in detention. These concerns dovetailed with the congregation’s focus on immigration issues. Sisters have attended vigils at the Detention Center, sponsored by First Friends and other faith based groups. Some sisters have completed the training required by First Friends to be visitors at the Detention Center. As a visitor in the Detention Center, one can be a messenger of peace while supporting the advancement of the human rights of the detainees. The sisters and associates contribute stationery supplies and financial support to the semi-annual ‘Stamp Out Despair’ campaign conducted for the benefit of the detainees. The Congregation lends its support as a co-sponsor of the Ash Wednesday Prayer Vigil held at the Elizabeth Detention Center and by including the Center as one of the daily prayer intentions of the sisters and associates. Our study and actions on Immigration led us to an awareness of the fact that Trafficking of Human Persons or Modern Day Slavery has become an international industry. It exchanges women, children and men for huge profits to a network of criminals. In January 2010 a Presidential Proclamation set the month of January as “National Slavery and Human Trafficking Prevention” month. In 2011 the President declared that this should be an annual observance since evidence indicated that modern day slavery abounds in our country and all around the globe. The Franciscan Sisters of Peace have joined other women's congregations in supporting LifeWay Network which has recently opened a Safe House in New York City to provide shelter and other services to women who have been rescued from sexual slavery. 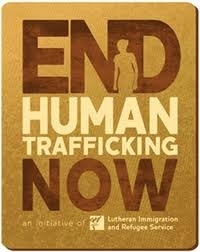 “We, the Franciscan Sisters of Peace stand in opposition to all forms of human trafficking.